Fes, Tanya, and Brett Hainly discuss why we used to review webcomics and why it has worn us numb. Why? Hint: We blame people that never learn. The show runs very long today. Perhaps its because we found so much that pisses us off. Aaron of The Best of What’s Left, a long time contributor to the show has officially become another co-host for the show! On top of that, we decided to go with Mark Savory, of Autumn Lake, to be our new Webcomic Reviewer! Officially! 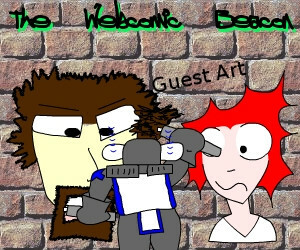 That’s right, he can do the webcomic reviews, instead! 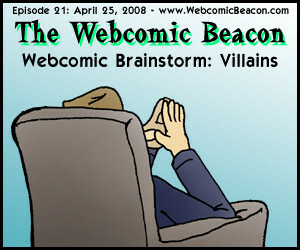 This week he reviews a comic that follows the story of Dracula by Bram Stoker, though it’s done in a furry style! Check out Dracula! Milestones this week include: Paranoia High hits 200 strips, Roomies hits 400 strips, Ardra hits 100 strips, and Boxcar Astronaut hits 1 Year. Notes: Sites mentioned this week (in mentioned order): Winger, The Webcomic List Forums, 8-Bit Theater, XKCD, Candi, College Roomies From Hell, Aaron Edwards’ Blog, Joel Fagin Tutorials, Darken, Crow Feathers, Dominic Deegan, (and for fun: ) Dominic Durgan, Diana Nock, Rene Engstrom, Something Awful Forums, and Grant Thomas. 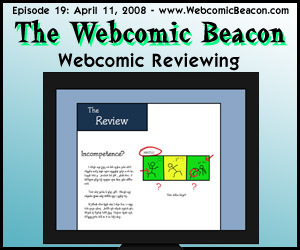 Other Webcomic Reviewers: Tangents and Websnark. If you know others, Let me know and I’ll add them to our main Reviewer’s list. Fes, Tanya, and Aaron are in the studio, talking about Guest Comics, Fan Art, and the etiquette that should be practiced around them. We are down all of the rest of our regular contributers this week, we hope to correct that soon! Some changes are slated for the near future, out of necessity. 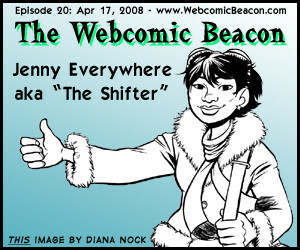 Webcomic Milestones: American Gothic Daily has hit over 200 strips, Girly will be hitting 5 years online, and Girl-a-Matic has hit 5 years online! Congrats! Notes: Sites mentioned this week (in mentioned order): Magical Misfits, Somery C, Ardra, Charles & Henry, Masters of the Art, Jenny Everywhere and the Crossing Over Worlds, Dinosaur Comics, Wayward Robot, Dum Bum, Times Like This, Camp Calomine, DMFA, The Webcomic List, Chip Shop Adventures, Phantasus, Plush and Blood, Guest Strip Project, WebcomicZ, Infinity Apartment, and Jenny Everywhere Chronicles.